RRB ALP Admit Card 2019 Is Released..!! So, candidates who are preparing well to attempt the Railway Recruitment Board Assistant Loco Pilot & Technicians (ALP) Examination 2019 must and should check this page. Also, the exam will be conducted on 8th February 2019. Furthermore, the direct link to download the RRB ALP Hall Ticket 2019 from the official site @ rrbcdg.gov.in is given to the end of this page. And the fine steps to download the rrbcdg.gov.in Admit Card, the RRB ALP Exam Date as well as the RRB ALP Selection Process 2019. Well, the officials of the Railway Recruitment Board had clearly mentioned the RRB ALP Selection Process 2019 on their official site @ rrbcdg.gov.in. Furthermore, candidates need to perform effectively in the initial round. Then only they can have the chance to attend for the next rounds in the entire Recruitment Process. Candidates must make a note that the scheduled RRB ALP Exam Date 2019 which is published by the Railway Recruitment Board. As per the latest update, the Assistant Loco Pilot & Technicians positions examination will be conducted on 8th February 2019. Furthermore, you must carry the RRB ALP Admit Card 2019 for the examination along with any ID Proof. Candidates should bring the printout of their RRB ALP Admit Card 2019 in the examination hall. Those who are waiting to download the RRB ALP Admit Card 2019 must and should check the complete stuff given on this page. We also heard that many of the candidates are facing issues while downloading the RRB Technician Hall Ticket 2019. So, to avoid those hurdles, we have presented you with the steps to download it straightforwardly. Candidates need to move to the official site of the Railway Recruitment Board @ www.rrbcdg.gov.in. Then, the home page of the RRB will appear on the screen. There, candidates need to search for the links that refer to RRB ALP Hall Ticket 2019. Soon after clicking that link, you need to enter the login details like the User ID (Registration number) and also the User Password (Date of Birth). Also, enter the text appears in the given box. 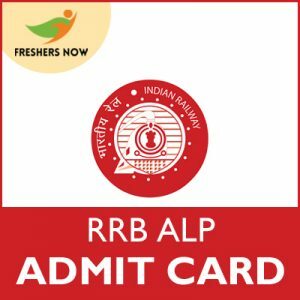 Click on Login to download your RRB ALP Admit Card 2019. Take the printed copy of the downloaded Hall Ticket. Keep it safe with you. We hope that all the above given RRB ALP Admit Card 2019 information is useful for all the applied candidates. So, keep an eye on our FreshersNow.Com to get all the latest updates. You can even drop your comment in the below section of this page so that we will soon respond to you.